During this school year, Tomahawk won their first basketball conference title since the 1927-28 season. This conference championship was huge in improving the numbers of participants who soon became solid competitors in everything they attempted. Say what you want, but winning takes care of any aches and pains, boosts the spirit and really makes the high school experience much more enjoyable. Let's look back at the basketball season. Tomahawk was 9-1 in the conference, 14-6 overall and had its first conference basketball championship in 35 years. Coaches for the squads were: Bill Fischer, Richard Strasser and Bob Meyer. 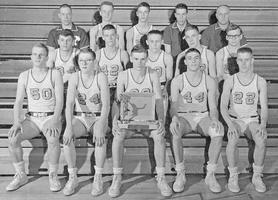 Members of the varsity squad were: Don Gruhlke, Dennis Hinterleitner, Jim Huhn, Ken Urso, Tom Gabriel, John Stelling, Bill Sparr, Jack Smith, Bruce Grube, Paul Wallis, Gary Hoffman, Pete Trantow and Roger Street. This success over the winter lead to many other success stories and seemed to propel Tomahawk to want to do great things. What a great year for some great individuals. This conference championship was just a taste of what was to come in the future when individuals dedicated themselves. Special thanks to the coaches and athletes for some special memories.